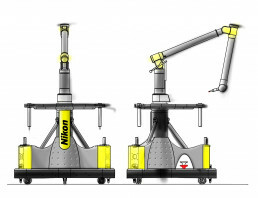 Nikon Metrology is a world leader in laser-based Large-Scale Metrology. Within the set of precision components making up the iSpace system, our task was to bring integration and user-centered design to two products – the iMCA Platform and the iSpace Transmitter Controller. Emphasizing economy of manufacturing and assembly, we were able to upgrade usability, operation, and human factors. Our design effort delivered solutions with clean, robust, technology-driven qualities consistent with the Nikon brand image.